Downloadable Plans You Can Print and Begin Building Now! 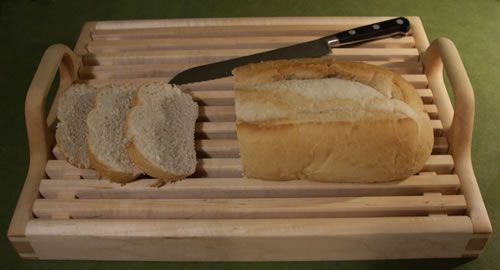 Wooden Bread Tray. (c) 2014 Chris Baylor licensed to About.com, Inc.
A bread tray is one of those items that you might not see in very many kitchens, but if you (or perhaps someone for whom you'd like to give this as a gift) are a bread baker, this project is perfect. This maple bread tray allows you to cut bread on the tray and serve the bread in a beautiful display, while the crumbs from cutting the bread fall to the counter below. A unique piece that is fun to build, and can be done easily with a radial-arm saw! Plastic Bag Saver. (c) 2014 Chris Baylor licensed to About.com, Inc. Even with many stores trying to convince shoppers that reusable canvas bags are a better choice, in many stores, plastic bags are still provided to customers to carry items home from the store. While throwing these bags away will contribute to landfill problems, many people find ingenious ways to reuse these bags for tasks such as cleaning up after their dog while on a walk. Such recycling is admirable, but storing plastic bags for later use can be a chore. You can solve the conundrum with this woodworking project to build a plastic bag saver. Simply lift the lid and drop the clean plastic bags into the saver after each trip to the store and then take one from the opening in the bottom next time you need one for a cleanup task. It keeps your bags clean, out of sight and ready for use when you need one! Modular Coffee Tables. (c) 2014 Chris Baylor, licensed to About.com, Inc. This is a fun project that matches well with many home decor styles. With these downloadable plans, you can learn how to build one or more L-shaped modular coffee tables. This unique design has a removable glass top and an underneath shelf for additional storage. Additionally, two or more of these modular tables can be moved around in different configurations based upon the other furniture pieces in the room, or they can be used independently of one another for displaying items in the corners of a room. A versatile and fun project to build. Computer Monitor Riser. (c) 2014 Chris Baylor licensed to About.com, Inc.
Computer monitors seldom are at the proper height on a desk to be directly in front of the user, and looking at a downward angle toward the monitors for hours at a desk is an ergonomically disadvantageous position. However, with your woodworking skills, you can build an attractive monitor riser that will lift your monitors off of the desk and give you two dovetailed drawers for additional storage. A very worthwhile project to build! Bathroom Vanity. (c) 2014 Chris Baylor licensed to About.com, Inc.
Every bathroom has a sink, and with the exception of pedestal or wall-mounted sinks, most bathroom sinks need a vanity cabinet to not only support the sink, but that also can provide storage for items needed in the bathroom. In this set of woodworking plans, learn how to build a basic bathroom vanity cabinet that can be adapted to nearly any size bathroom and sink/countertop. Classic Wooden Toolbox. (c) 2014 Chris Baylor licensed to About.com, Inc.
For many years, the classic wooden toolbox was a staple for carpenters, blacksmiths, plumbers and other tradesmen, as it was a durable and convenient method for carrying around the tools that the worker needed at any time. In recent years, this toolbox has really disappeared from the landscape, but with this easy-to-build set of plans, you can build one that will stand the test of time! Knick-Knack Shelf. (c) 2014 Chris Baylor licensed to About.com, Inc.
One can find some form of a knick-knack shelf in just about every home, as they are perfect for displaying trinkets of sentimental value, such as photos, mementos or trophies. In this set of free woodworking plans, download the measured drawings to build a three-shelf unit to display a variety of items on your wall. Louvered Window Cover. (c) 2014 Chris Baylor licensed to About.com, Inc.
Making a louvered shutter or door can be a bit tricky, but it doesn't have to be when using the proper jigs. In this woodworking project, learn the basics of building louvers, and how to adapt them to doors, window cover and shutters for any installation. Should You Use Heartwood or Sapwood for Woodworking Projects?